Each year in the second week of September the Hiratsuka Hachimangu(平塚八幡宮) in Sengen Town, Hiratsuka City holds it’s annual bonbori ( ぼんぼり, paper lantern) matsuri. Other cities around Japan have similar lantern festivals throughout August and September. Each year in the second week of September the Hiratsuka Hachimangu(平塚八幡宮) in Sengen Town, Hiratsuka City holds it’s annual bonbori (ぼんぼり, paper lantern) matsuri. Other cities around Japan have similar lantern festivals throughout August and September. 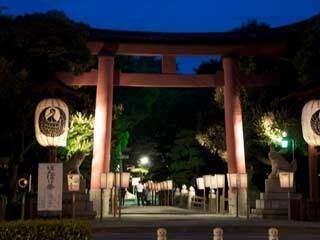 Poems, haiku and paintings on hundreds of bonbori from famous Shonan inhabitants and prominent members of the local community are displayed all around the shrine grounds and lit up at night. Lanterns are submitted by many artists, novelists and famous people attracting many fans and admirers. The entire area surrounding the Hachimangu becomes lively as people from all over the Shonan area come to read the poems and haiku and enjoy the hand-drawn pictures on the bonbori. The bonbori themselves are hand-made from a square wooden frame with traditional washi (Japanese paper) stretched over the frame. The paper itself is made from the mulberry tree and is water resistant. This traditional Japanese paper glows nicely when lit from within by candle light. Historically, bonbori lanterns were portable and distinctively hexagonal in shape. Today they are square and their purpose is purely decorative. The major attraction of the first day of this four day event is the lighting of the hundreds of individual bonbori by the shrines female attendants (miko). Hundreds of photographers turn out for the lighting of the bonbori and attempt to catch rare shots of the shrine attendants lighting the bonbori. Traditional Japanese dance is performed by numerous professional dance teams with famous people from the Shonan area coming to watch. There is also a Noh mask and traditional ceramics exhibition.